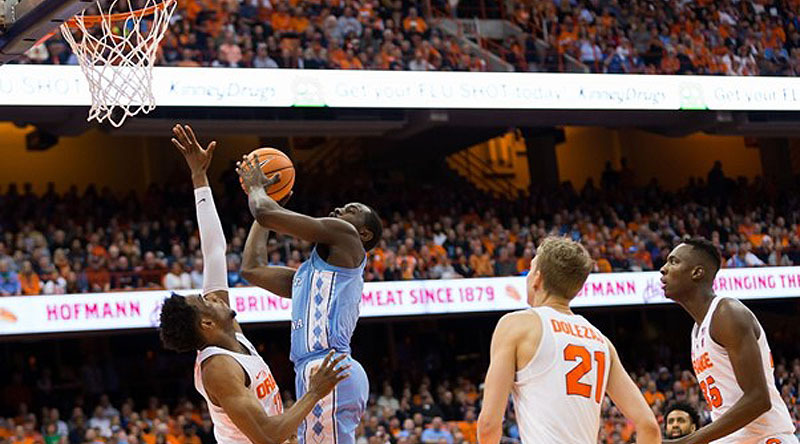 SYRACUSE, N.Y. — Theo Pinson scored a career-high 23 points and No. 10 North Carolina defeated Syracuse 78-74 on Wednesday night. Pinson, who shot 9 of 12 from the field and made both on his 3-pointers, also had seven assists, six rebounds and three steals for the Tar Heels (22-7, 11-5 Atlantic Coast Conference), who won six straight. Joel Berry II added 18 points with four assists and Sterling Manley finished with 12 points and six rebounds for North Carolina, which shot nearly 45 percent and had 25 assists on 29 made baskets. Luke Maye, who is averaging a double-double in points and rebounds this season, was held to just nine points on the night for the Tar Heels. Meanwhile, Tyus Battle paced Syracuse with a game-high 26 points to go with six assists, while Frank Howard added 23 points in the defeat. Oshae Brissett ended with 17 points, 10 rebounds, three assists and three blocks for the Orange (18-10, 7-8 ACC), who lost two of the last three games. The North Tar Heels return to action at home against Miami on Tuesday night. The Syracuse Orange will next travel to play No. 5 Duke on Saturday night.